ERG recognizes its need to be a good corporate citizen and is committed to compliance with worldwide environmental & quality regulations. IPC, the Association Connecting Electronics Industries, is an organization whose aim is to standardize the assembly and production requirements of electronic equipment and assemblies. ERG currently adheres to IPC-A-610 Class 2 on all of its products. Our certified inspectors ensure all product conform to the standards set by the association during manufacture and testing. 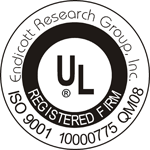 ERG is ISO 9001 certified by UL DQS Inc..
Endicott Research Group, Inc. is committed to being RoHS compliant. We also understand a “lead-free” product may not be suitable for every application so we will continue to offer our “tin-lead” products indefinitely. Part numbers for RoHS compliant products will be our standard part number followed by an upper case “F”. For example, our standard product part number E1340 (tin-lead) becomes E1340F (lead-free). The pricing for either part number remains the same. Non-standard products will be handled in the same manner. All manufactured harnesses at Endicott Research Group, Inc. are lead free unless stated differently. If a customer requires change in the part number to denote RoHS compliance for specific approval agencies, ERG will provide a suffix ‘F’ at the end of the part number at no additional cost. For example, a harness part number H1308460 will be changed to H1308460F for the specific customer. The pricing for either part number remains the same. Non-standard products will be handled in the same manner. All of our products are available using either Tin Lead or Lead Free Solder. REACH is an acronym for Registration, Evaluation and Authorization (and Restriction) of Chemicals. This EU ‘regulation’ came into force on June 1, 2007 and is intended to be a support for global efforts on environmental protection. Endicott Research Group, Inc. is committed to compliance with the REACH directive. All of our products are free of PFOS (Perfluorooctane sulfonate).